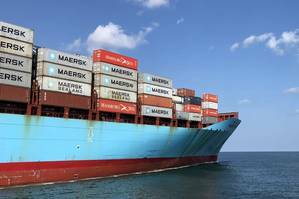 The BAF surcharge will be introduced on January 1, 2019, replacing Maersk Line's current Standard Bunker Adjustment Factor (SBF) surcharge. The new surcharge considers the average fuel price in key bunkering ports around the world as well as a trade factor that reflects the average fuel consumption on a given trade lane as a result of variables like transit time, fuel efficiency and trade imbalances between head haul and backhaul legs, Maersk Line said. Combining the two factors gives customers full predictability of their costs at any given fuel price both before and after 2020, according to Maersk Line. The BAF surcharge will be charged separately from the freight rate. "The 2020 sulphur cap is a game changer for the shipping industry," said Vincent Clerc, chief commercial officer, A.P. Moller - Maersk A/S. "Maersk preparations to comply are well underway and so are our customers' efforts to plan ahead. The new BAF is a simple, fair and predictable mechanism that ensures clarity for our customers in planning their supply chains for this significant shift." Maersk Line has maintained that it will mostly rely on low sulphur fuel to meet the 2020 requirements, although it has recently invested in a limited number of scrubbers. The company said it expects to spend more than $2 billion to meet the sulphur cap requirements, and added that the cost for the global container shipping industry to comply could be up to $15 billion.